I have been quite happy with one hour, and the way the app tots all those little bouts of walking during the course of the day, then rewards me with a starburst of congratulation when I reach 60 minutes – “You achieved your goal!”. It’s not so difficult to achieve one hour, so it might be tempting to go up to 1 hour 15 minutes, even one hour 30. But I won’t be pressured. The app just wants to feel wanted. I think I’ll hold to the round 60 minutes for a little longer. I picked up this very nifty, and free, Android app recently, just when I thought my Moto G (3rd Gen) was giving me all the assistance, guidance, information and entertainment I needed. Fit is still fairly basic, but perfectly adequate for day to day activity tracking. It estimates steps taken, calories burned and distance covered. I had been thinking about one of those wearable activity trackers at £100 or more, and certain to be superseded in a year or two. Now I have this sharp new assistant on my smartphone, it’s an investment I can put back for a time. I’ve said it before, but this current blossoming of the smartphone’s capabilities continues to astonish me, as an older user of tech. (But by no means a late adopter. I bought my first computer, a Commodore 64, with its 1.023MHz processor and 64kb of RAM, in 1982. Together with the screen, printer and separate operating system, it cost over £1000, at the prices then. If someone had told me then that less than 20 years later, by 2016, that I would be fulfilling most of my tech needs, and several I never knew I had, on a device costing £159, with 1 GB of RAM and 1.4 GHz processor, I would have assumed I had met a fantasist. Six months after acquiring this phone, it’s easier to tick off the things I cannot do with my Moto G. Android doesn’t support FaceTime, so I can’t talk to family members for nothing on their iPhones. I have Skype, of course. I have WhatsApp – Android phones can speak to IOS – and find it by far the most useful form of communication without speaking to people. In fact, it’s much more useful than speaking to people, because the number of people you can reach at the same time. And now WhatsApp is rumoured to be planning a video call feature – IOS first and Android to follow. As for the video function, I’m not sure if I could shoot a movie of the quality of the Hollywood film Tangerine, which was made on an iPhone5. However, I use the 13 MP camera on my Moto G for stills all the time, and have no intention of buying a real camera, possibly ever again. I use it as a radio, always close at hand when I’m washing-up for example, although increasingly, rather than listening to live radio I find something from several days ago on BBC iPlayer, which I can then carry over to the car. To complete that list, my phone is also a daily brain trainer, with Elevator, and a language tutor – Duolinguo. Oh, and it always knows where I am, this GPS-equipped supercomputer in my pocket. In the face of all that, my one recurring grumble seems trivial in the extreme. When swiping to the previous photograph in camera mode, I often seem to turn on the zoom function instead. On the other hand the battery is better than the previous model, and I can easily last a day away from a charger, although, again, those small backup charges are a boon. For for my next trick, should I pluck up courage to place the phone in one metre of water for three minutes? I am assured it will carry on working, but I think I will wait until the phone is in a real-life watery drama situation? Now it’s 2016. What do we have to look forward to in smartphones? The pundits are making much of the new Snapdragon 820 processor – my Moto G runs on the Snapdragon 410. It is said to consume 30% less power than even the 2014 Snapdragon 810 chip, and to run less hot – “more thermally efficient”. It will offer faster download and upload speeds, capture photos that are closer to what your eye actually sees, and produce better sound through its loudspeakers. It is expected to be on Motorola’s top end Moto X Force and other premium phones, by the end of 2016. 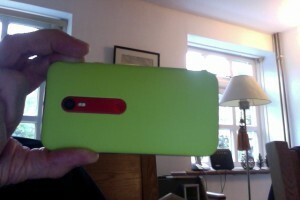 Previous pieces by me on Motorola Moto G.
Motorola unveils new version of Moto G – smartphone for the masses? Previous PostHow people of Jericho built Britain’s daftest, most heroic railway	Next PostCould the self-driving bus save rural public transport?